The first running book by a leading pioneering running doctor and athlete, creator of the Air Force's Efficient Running program--the result of more than three decades of study, practice, and science that shows us in clearly illustrated and accessible text how easy it is to run efficiently and injury-free, whether you're in your twenties, sixties, or seventies--for beginning runners and experienced marathoners. In Run for Your Life, Dr. Mark Cucuzzella explains the simple mechanics of how our bodies have evolved and adapted to run. Despite our natural ability and our human need to run, each year more than half of all runners suffer injuries. Pain and discouragement inevitably follow. 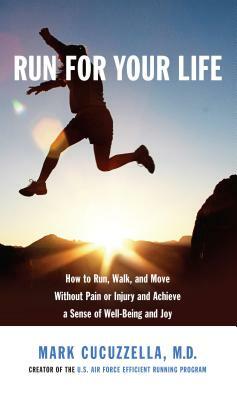 Cucuzzella's book outlines the proven, practical techniques to avoid injury and reach the goal of personal fitness and overall health. His book--the first running book to be written by a professor of medicine with the credibility of the Air Force behind him--gives us a straightforward, easy-to-follow look at the anatomy, biomechanics, nutrition, and/or clinical medicine with clear drawings and black-and-white photographs. The book provides illustrated exercises designed to teach healthy running, along with simple progressions, a weekly/monthly schedule detailing common mistakes, and cautions that allow the reader to tailor the training regime to individual needs and abilities. With an annotated list of videos and other innovative, book-Internet links. The proceeds from RUN FOR YOUR LIFE will go to support Mark Cucuzzella's community work through his non-profit organization, Eastern Area Health Education Center/Freedoms Run. DR. MARK CUCUZZELLA, Air Force Reserve lieutenant colonel, practices family medicine in Ranson and Martinsburg, West Virginia. He is a professor at West Virginia University School of Medicine, and conducts Healthy Running Medical Education courses. He has run competitively for almost four decades, with more than one hundred marathon and ultramarathon finishes, and he continues to compete as a national-level Masters runner with an active streak of thirty straight years under a 3-hour marathon. Cucuzzella owns the first minimalist running and walking store, Two Rivers Treads, in his hometown. He has also been named a Distinguished Mountaineer by the governor of West Virginia, a Blue Ridge Outdoors Pioneer, Air Force Athlete of the Year, his home county's Citizen of the Year, Boys and Girls Club of American Champion for Youth, and Colorado Academy of Family Physicians' Teacher of the Year.